June 13, 2013 – The U.S. Supreme Court today in a unanimous decision ruled that companies cannot patent human genes, a decision predicted by University of Houston Law Center Sapna Kumar in a March Q&A for the school's website. Kumar explained the issues involved in the case as well as what it means for research companies and the average citizen. March 13, 2013 -- Scientists today are rapidly developing diagnostic tests to detect mutations in our genetic code that contribute to disease. These medical miracles, 60 years after the discovery of DNA, can lead to early diagnosis and treatment of diseases even before symptoms appear. But the availability of broad gene patents has limited the use of this diagnostic testing. A scientist who identifies the function of a gene, and then isolates and purifies the gene, can obtain a patent through the U.S. Patent and Trademark Office. The patent effectively gives the scientist a monopoly over diagnostic testing for the gene, as well as the power to shut down not-for-profit research and testing on the gene. Thus, although the means may be available to test for the risk of specific diseases—such as various forms of cancer—individuals may not be able to access their own genetic information to make informed decisions regarding medical treatment. The issue of the patentability of genes under the Patent Act is currently before the Supreme Court in Association for Molecular Pathology v. Myriad Genetics. Q. Please explain what gene patents protect. If it is the diagnostic process itself, aside from moral and ethical grounds, should it be treated any differently than any other diagnostic tool protected by patent? If a scientist discovers that a particular piece of genetic code causes a disease, that discovery alone cannot be patented. But if the scientist then isolates the relevant DNA, he or she can obtain a patent on it. Because diagnostic testing for genetic mutations generally requires the use of isolated DNA, gene patents have the effect of granting a monopoly to the scientist on diagnostic testing. So for example, mutations of BRCA1 and BRCA2 are linked with a high risk of breast cancer. Because Myriad Genetics holds those gene patents, it controls all testing for the mutations. The difference between gene patents and other diagnostic tools lies in the fact that there is no work-around. Once a gene is patented, there does not appear to be a way under current law to work around the patent. This is in contrast to patents that cover a particular method or tool for testing a patient. Gene patents cover something far more fundamental than a typical patent. Q. Can you elaborate on how this affects the average person? We saw several examples of how gene patents affect the public in the Myriad litigation. Many women have a history of breast cancer in their family, and are at risk for carrying the BRCA1 or BRCA2 mutation. However, Myriad limited the testing that was available to that which they could perform. For example, in 2005, the Yale DNA Diagnostic Lab contacted Myriad, asking for permission to perform a new type of testing that could predict cancer risks for women that were being missed at the time. Myriad refused, even though it took a full year before they were able to offer the equivalent test. Another problem is the lack of availability of secondary testing. If a patient is about to make a major medical decision based on genetic test results, it is natural for him or her to want a second lab to confirm the test results. With gene patents, the patent holder does not have to permit this. It is not unusual for only one laboratory to hold rights to testing for a particular mutation. Q. What path did previous challenges take and please explain your constitutional argument? In Association for Molecular Pathology v. Myriad Genetics, the issue before the Supreme Court is whether genes are patentable subject matter under the Patent Act. Section 101 of the Patent Act does not permit patents for natural phenomena. The plaintiff in that case argues that gene patents cover DNA that is too similar to the DNA in our own body, thereby violating § 101. In my article Life, Liberty, and the Pursuit of Genetic Information, I make a different argument—that gene patents violate the Fifth Amendment's Due Process Clause. Patients have a substantive right of bodily integrity, which includes the right to make informed medical decisions. Gene patents can potentially block a patient from learning about their own genetic information. This prevents the patient and his or her doctor from making the best decision regarding which course of treatment to pursue. These issues surrounding gene patents are different from, say, the access to medicine debate. With access to medicine, people are asking outside pharmaceutical companies to provide them with drugs, or for the FDA to waive its procedure that is intended to protect people from harm. With genetic testing, technological advances are increasingly making it possible for doctors to perform some genetic testing in-house. We are rapidly reaching the point where genetic testing could be a private matter between a doctor and a patient. Q. What recommendations do you have for the Supreme Court? The issue of whether gene patents are unconstitutional is not directly before the Supreme Court. However, the Court does not have its hands tied. The doctrine of constitutional avoidance is a rule of thumb that courts should minimize constitutional violations when interpreting statutes. In this regard, the Supreme Court should interpret the Patent Act narrowly to not permit gene patents. It should furthermore direct Congress to amend the Patent Act to include safeguards that prevent future due process violations. Q. What revisions would you recommend to the Patent Act? The biggest change needed in the Patent Act is a compulsory licensing provision for gene patents and other diagnostic patents that block patient access to genetic information. Under such a provision, any laboratory would be able to offer genetic testing, provided they pay fair market value for a license from the patent holder. This would prevent situations where the gene patent holder refuses to make a test available at all or where it refuses to allow for secondary testing. 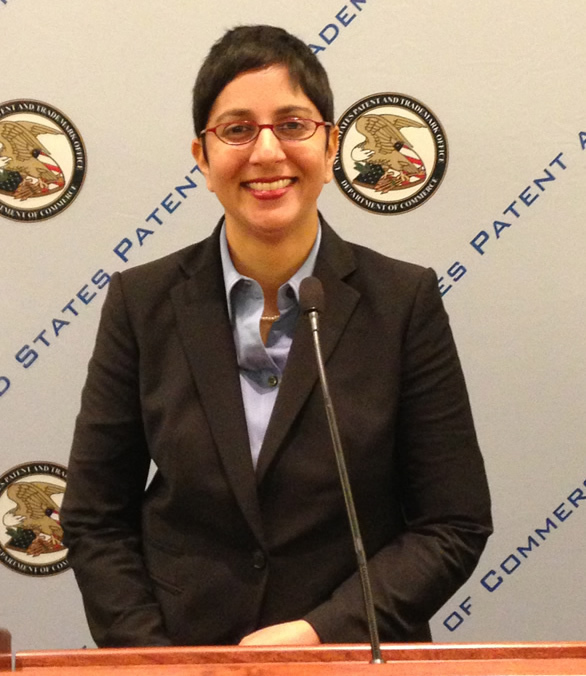 Professor Kumar is a registered patent attorney and has recently participated in a roundtable on genetic diagnostic testing hosted by the U.S. Patent and Trademark Office in Alexandria, VA. She also has written an article, Life, Liberty, and the Pursuit of Genetic Information, available at http://ssrn.com/abstract=2203436. To schedule a media interview with Professor Sapna Kumar, contact Carrie Criado, Executive Director of Communications and Marketing, 713-743-2184, cacriado@central.uh.edu; or John T. Kling, Communications Manager, 713-743-8298, jtkling@central.uh.edu.